Let me first start off by saying, this post is looonngg! But we are entering into a time of renewal, and there is just way too much that needs to be said, so please bear with me. I thank you in advance. Equinox means equal night and is derived from two Latin words — aequus (equal) and nox (night). Thus, an equinox is a period of time when the amount of sunlight and night are near equal along the Earth’s equator. This event happens twice per year in the spring and in the fall. The Vernal or spring Equinox marks the beginning of spring and happens around March 21st. Vernal is from the Latin word vernare which means to bloom. The Autumnal or fall Equinox marks the beginning of fall and happens around September 23rd. Because the sun is positioned above the equator, day and night are near equal in length all over the world during the equinoxes. In many cultures this is a time for rituals of balance and new beginnings, and even marks the beginning of the year itself. There are two Solstices each year. These events mark the longest and the shortest days of the year and usher in summer and winter. The summer Solstice marks the beginning of summer and happens when the sun is directly over the Tropic of Cancer, which is located at 23.5° latitude North around June 21st. For every place north of the Tropic of Cancer, the sun is at its highest point in the sky and this is the longest day of the year. The winter Solstice marks the beginning of winter and happens when the sun is directly over the Tropic of Capricorn, which is located at 23.5° south of the equator around December 21st. For every place north of the Tropic of Capricorn, the sun is at its lowest point in the sky and this is the shortest day of the year. It is truly in nature that we have an accurate measure of the seasons and a scientific measurement of the procession of our year. So, what or who changed everything? The Romans. During the seventh century (around 713 BC, the Romans decided that nature-based calendars used since the dawn of time needed to be changed to reflect their policies and beliefs. They took the calendar most widely used at the time, which was the lunisolar calendar, and reformed it. This reformation began with what they called the Roman calendar. This calendar ultimately was reformed by Julius Caesar in 45 BC and called the Julian calendar, and was again reformed in 1582 and named after pope Gregory XIII, the Gregorian calendar. In the Julian calendar, the year was calculated to be 365 and 1/4 days, and Caesar added 67 days to 45 B.C., making 46 B.C. begin on January 1, rather than in March. 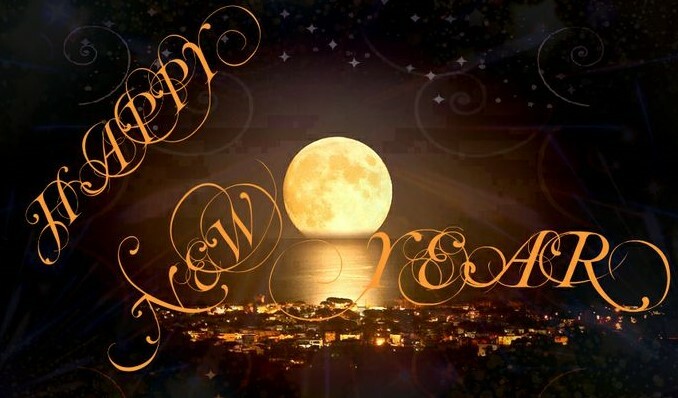 In the Gregorian calendar, New Year occurs on January 1. Beginning with the October 1582 adoption of the Gregorian calendar, and changes to the Old Style and New Style dates, various local dates for New Year's Day changed to using one fixed date, January 1. In the Middle Ages in Europe a number of significant feast days in the ecclesiastical calendar of the Roman Catholic Church came to be used as the beginning of the Julian year. Starting on January 1 with the feast of the circumcision of christ. The widespread official adoption of the Gregorian calendar and marking January 1 as the beginning of a new year is almost global. However, various indigenous South American, Jewish, Chinese, Indian, and other indigenous people around the world continue to celebrate New Year on different dates. Mostly on or near the Vernal Equinox. Historically, the beginning of the year happened on the Vernal Equinox and was observed by various nations, namely the Babylonians; the Hindustani (Nava Varsha); the Zoroastrians, Persians, and Iranians (Nowruz); Central Asia (Nauryz); Hindus (Nyepi); Kashmiri (Navreh); Ancient Egypt/Khamat celebrated the Opening of the Year (Wp(t) Rnpt), usually transcribed as Wep Renpet) with a celebration called Shamo, meaning renewal of life. Like many of the aforementioned celebrations, Sham El-Nessim has been celebrated for millennium. Egyptians, regardless of their beliefs or social classes, have been celebrating Sham El-Nessim, which literally means "smelling the breeze," with feasts in parks since 2700 BC, towards the end of the 3rd Dynasty. High Priests and Priestesses would announce the beginning of the year, that would begin a feast of traditional foods and periods of time spent in the new spring air. Shame El-Nessim is seen as a restart for life. The holiday's name is derived from Shamo, the harvest season for ancient Egyptians, which means the day of renewal of life. The foods consumed on Shamo are still eaten today. Romaine lettuce and malana-green chickpea shoots, which symbolize the resurgence of life, became plentiful during the receding of the past annual Nile flooding. The new year of the people of the Nile was changed under Roman rule, after Agustus Reformed their calendar. Using the first day of Thoth 1 (which usually occurs on August 29 in the Julian calendar, except in the year before a Julian leap year, when it occurs the next day) as the new year under the Coptic church. The leap years removed from the Gregorian calendar means that it presently falls on September 11 or 12 but on different days before 1900 or after 2100. This observance is known as Enkutatash by the Ethiopians. At the end of the day, it makes sense that the real New Year is when the cycle of life begins, with the advent of spring, the Vernal Equinox. It happens on March 20th and it is the point in time when the length of both day and night are near equal. Life does not begin anew in the dead of winter. A time when even the animals hibernate, and the flowers and trees have no life blooming within them. As beings of love, light, and life, why should we observe the new year during any other time, then at the start of light and life? This year we have a special occurrence taking place. The Vernal Equinox occurs on a full moon, toward the end of the first Mercury Retrograde of the year. And, if that isn't enough, this full moon is a SUPER moon! Be flexible and ready to make some adjustments in response to changing condition or unexpected opportunities. The coming full moon brings with the promise of new love or a mending of relationships. It also promises to be a good time for making money from buying and selling, especially online. March’s Full Moon opens a portal to a new wave of energy, especially seeing that it falls during the same time as the Vernal Equinox as well as the new year. All of these astrological occurrences bring with them the beginning of a new cycle. But, in order to enter into the new, we have to purge and release the old. We have to wipe the slate clean and be ready to begin again. We have to return ourselves to ground zero. Zero is the number of infinite potential, and it’s no coincidence that the March Full Moon falls at zero degrees of Libra. At the time of the Full Moon, we will actually have three planets in the cosmos aligned at the vibration of number zero, which means the Universe is just going to be blossoming with potential. This energy is going to renew, revive, and regenerate. The energy that this Full Moon will bring with it a new portal of energy that will vibrate higher than any energy we have experienced for a long time. Not only is it going to help us awaken to new potentials and opportunities, it is also going to open and guide us into higher realms of consciousness. We will be called to take inventory of how we are using our energy and to assess whether we are using it in a way that serves us or drains us. We will need to realize that we need to let some things go, and to do away with things take up too much of our precious energy reserves. We may also find that we need to protect our energy or adjust the flow of where we are directing it. Any answers you are seeking may be answered during this time. During this Full Moon period (March 20-21), meditate and use your crystals to help you find your center. This Full Moon will help us return to a blank slate, so we can begin anew. Its energy will encourage peace, and self-realization. It will help us attune with self, and nature. It is no coincidence that the Universe has aligned the cosmos in this way. Let us take advantage of this wonderful opportunity to truly celebrate the new year, the beginning of new life, and the infinite possibilities it brings. Crystals to use during this time are Moonstone, which will work with moons energy to help bring newness, restoration, and healing; Clear Quartz, which amplifies abundance and helps harvest manifestations; Selenite, which recharges your inner being, and helps repel negative energy and low vibrations; and Mookaite, the Mother Earth Stone, imbues the invigorating frequency of the Life Force, and empowering and interconnecting our inner being with that wonderful energy. Use the next few days leading up to the Full Moon to cleanse your closets and drawers and sleeping area, and get rid of all unnecessary clutter. The day before the Full Moon, use its growing energy to cleanse and recharge the stones you will be using for your ritual. Have a healing and prosperous Wep Renpet!